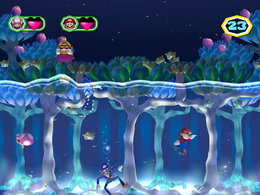 Sink or Swim is a 1-vs-3 minigame in the game Mario Party 6. Its name is a play on the phrase "Sink or Swim", meaning to get something right or fail, with no intermediate outcomes. The introduction shows the one player trying to drop a mine on the player in the middle of the pond, misses, and the player would go back to his or her place. The whole point of the game for the three players is to avoid the mines that the solo player drops from above the pool in which they are swimming underwater. 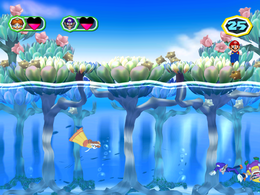 The three players have a life meter; if they stay underwater too long, they will float to the top to get air, making it easier for the solo player to drop mines on them. Whenever the solo player drops a mine on one of the other players, they will sink. When the one player drops mines on all the other players, he or she wins, but if the three players survive long enough, they win. Rules – "One player drops mines in a pond while the other three players have to avoid getting hit!" Advice 1 – "Don't stay underwater too long or you'll run out of air! Look for opportunities to go to the surface!" Advice 2 – "The player on the surface should watch the others and aim carefully." This page was last edited on January 16, 2018, at 13:14.